We experience the built environment differently according to who we are. If urban dwellers are to feel accommodated and welcomed, our diverse requirements need to be considered in the design of the spaces and buildings we move through every day. Universal design, (also known as accessible design or inclusive design), is the practice of creating spaces and environments that do not exclude particular groups or communities. In the last decade or so, accessibility has improved, and inclusive design is a central consideration of more projects and spaces now than ever before. The situation is improving, but in some cases planners still have some way to go towards creating spaces that integrate inclusive features as a matter of course. For Woodhouse, a large scale project on Exhibition Road in central London was an great opportunity to apply principles of universal design. There was a great emphasis on the removal of street clutter in this project, so features such as street furniture and lighting had to be carefully placed. To give the street a more open feel, kerbs were removed, removing the sense that motor traffic dominates. Marshalls bespoke corduroy paving was added to the design, to demark the boundaries of the pedestrian spaces for the visually impaired. Street furniture was also chosen with access in mind. The seating elements used from the Geo range include armrests and seats within a range of specific heights, to help the mobility-impaired to sit and rise comfortably. The side profile is clear, the colours contrast appropriately with the surroundings, and armrests appear at regular intervals all the way along the benches, for easy identification by the visually impaired. Bins are carefully placed away from main access routes in pedestrianised areas, so as not to cause obstructions, and are mounted on luminaire columns, off the floor. Lighting was crucial to making this space feel inclusive. A street that is badly lit at night excludes a significant cohort of would-be pedestrians and cyclists. When there is a question around seeing and being seen in an area after dark, it tends to be avoided at night, which leaves only drivers, those who may have to use the area for work or business, and street users who do not want to be seen. The alternative walking route between two tube stations is a long subway, which may not seem attractive for many pedestrian street users. 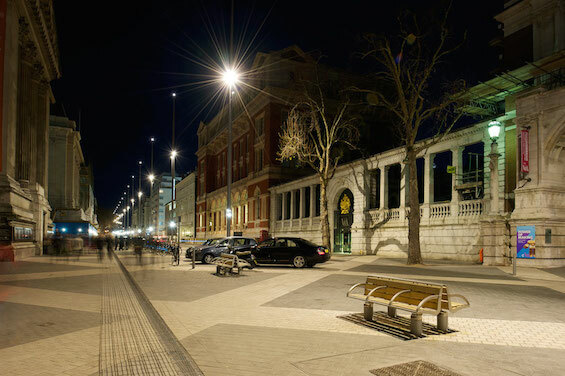 Woodhouse’s lighting solution brings Exhibition Road to life at night. The concept involved a series of 20m masts, which were engineered for aesthetic impact, elegance and to ensure functional lighting levels for all users. Three recessed white-light lanterns in each mast provide the required level of uniform illumination to the road surface. These functional elements are complemented by the decorative: an array of white LEDs clustered at low level, an LED ‘starlight’ finial atop each mast. Adapting existing spaces to be inclusive for all, especially those with such great social and cultural value, is not a mission without its challenges. It is, however, a mission worth pursuing, considering the great social and economic changes that can be brought about through sensitive design in landscape architecture.